Sometimes when I walk around my quiet neighborhood, I wonder what it would be like if all the humans disappeared. I know that’s a little twisted, but its an intriguing idea. This is a very quiet place most of the time. There are no kids here, and people are at work during the daytime. So sometimes as I walk around in the summer, I feel like I’m the only person left. Sometimes I wonder how long it would take for the woods to come back, for the forest to reclaim our yards and driveways and streets. Today as I was walking my dogs, I stopped in front of one of the abandoned houses on our street. It makes me sad to be there, to think about the people who no longer live in that little house. I stood remembering my friends, thinking about the kids who grew up with mine. The house has been abandoned for about two years now. It stands alone at the top of our street, empty. It used to have a wide cedar deck, wrapping around two sides. Now the boards are warped and buckling, and the steps have fallen in. I stood there for a minute, the dogs panting in the bright morning sun. 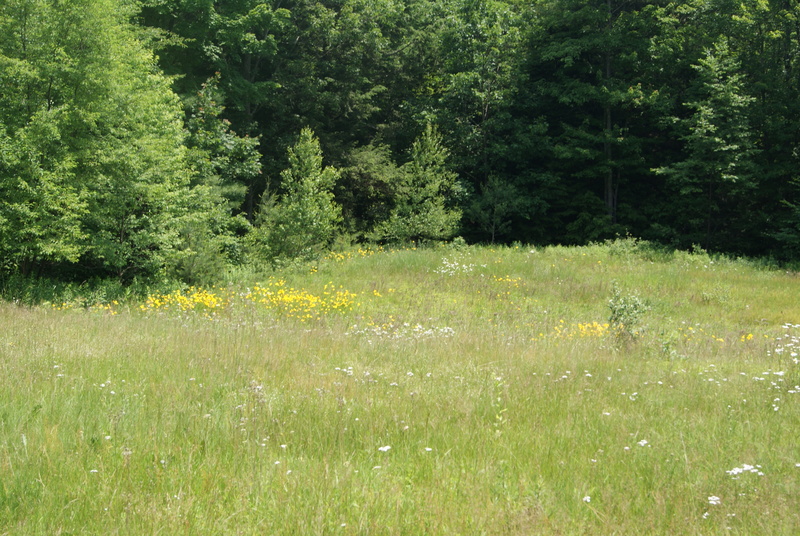 I looked across what used to be a big sloping lawn, and I saw a meadow. Daisies, yarrow, coreopsis, Timothy grass. When I looked a little bit closer, I could see that young trees are already springing up, ready to take over now that the mower is gone. There were tiny sumac, some baby birches and even a little cherry tree. I saw my friend’s garden, turning into a meadow far more quickly than I would have thought. I saw weeds crowded together where her foxglove used to stand, and grass as high as my knees surrounding her little patch of phlox. 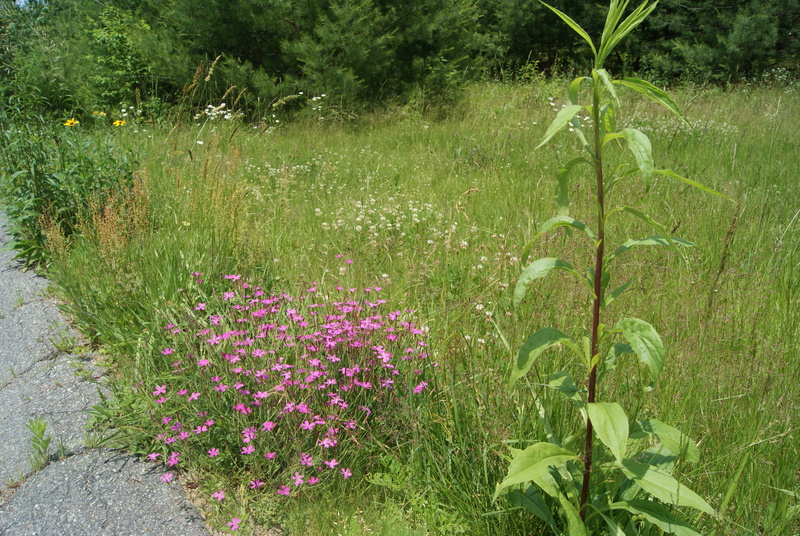 Phlox and weeds, side by side now. We finished our walk, the dogs and I, leaving the lonely house behind us. We headed down the hill, following the road as it would through the thick woods on either side. As we walked, I looked around me, more closely than I usually do. And you know what I noticed? There are trees creeping slowly into the edges of every yard, saplings standing where just a few years ago there was a baseball diamond. Where there used to be small dirt roads, there are now groups of slender maple and oak saplings. Ferns and daisies fill every open spot on either side of the street. So now I think that the famous New England forests are poised and ready, waiting to rush back in as soon as our backs are turned. 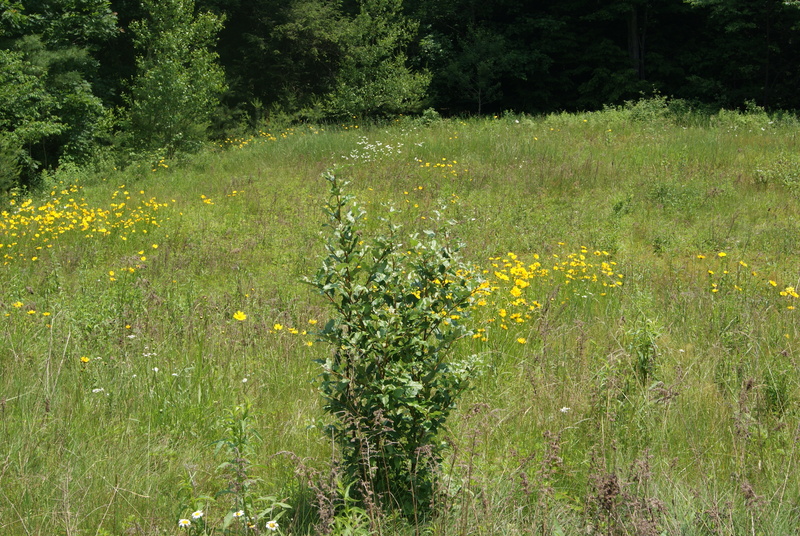 I think that if the mowers and trimmers were suddenly rendered powerless, all of our carefully cultivated civilization would disappear and we would go back to the tree covered wilderness that we were three hundred years ago. And you know what else I realized? I think that’s a pretty cool idea. Glad you came by, and glad you like it, Alex. It is a pretty nice idea, actually. It is lovely to watch. Unless of course it was once your property or that of a friend. It must be sad to hear those echos. It is sad, but in a strange way, I like the idea of the woods coming back in. The house simply crumbling is painful, but if it will be covered soon by trees and flowers….. I believe that I am something of a misogynist! Nature lover sounds so much better. I’d use that one if I were you.